The pursuit of ideal beauty in any given culture has historically involved some modification of the human body. The practice of manipulating flesh for the sake of beauty spans the whole of human history, and many myths regarding the lengths to which women will go to achieve perfection exist throughout the body of fashion studies. Perhaps no other era has spawned more controversies on the subject of figural distortion than the late nineteenth century. 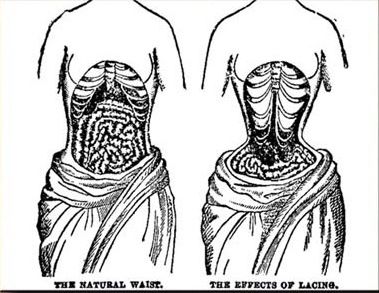 It was during this time that the centuries-old practice of wearing what was later termed the “corset” became the subject of serious health concerns, due in part to the practice of tight-lacing among a minority of the fashionable population. This paper will examine myths about the corset that originate from this period of the undergarment’s history, which label its wearers as frivolous, vain, and willing to undergo surgical procedures in the pursuit of an ideal figure. These negative perceptions persist in twenty-first century popular culture despite a lack of medical evidence. This paper will also explore ideas about the corset as a signifier of feminine power and eroticism in the history of fashion. How has the “corset” changed – in name and symbolism – and how have our clouded perceptions contributed to the mythology of this misunderstood undergarment? This entry was posted in Symposium and tagged 19th Century Fashion, Fashion Myths. Bookmark the permalink. Way to go guys!! I so wish I could be there to attend your symposium. Such a fantastic topic. Best of luck to all. Oh sigh, I can’t attend, but I would absolutely LOVE to. I hope that your paper is published and will eventually be available to read.